Nice simple English ale. Ruby coloured with a nice thick head on it. Smells a little hoppy. Very very easy to drink. A bit sweet and bitter, caramel like. Perhaps malty toffee. I like this. Could drink it a lot. Goes down very well. 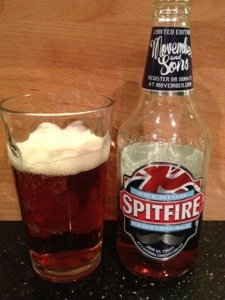 This entry was posted in beers and tagged kent, shepherd, spitfire. Bookmark the permalink.